Comments: Eastern fox squirrels have fox-like, bushy tails with orange fringe and reddish-orange fur. They are larger than eastern gray squirrels and spend more time on the ground. Several nests of leaves may be constructed in forked branches high in trees and used for resting or rearing their young. During winter they prefer nests in hollow trees. Their behavior, reproduction, and longevity are similar to gray squirrels. Distribution: The range of eastern fox squirrels is from northeast Mexico through the eastern half of the United States into south-central Canada. They are common in oak-hickory woodlands and wooded parks and neighborhoods throughout Kansas. Food: They feed on nuts, seeds, berries, buds, and insects. Occasionally they eat bird eggs and nestlings. 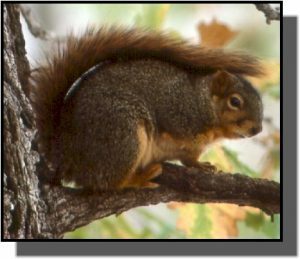 For more information, read the GPNC Fox Squirrel Portrait.